“Know Your Niche” from Christian Faith Publishing author John Merola is an inspiring book that motivates people to pursue a life mission on fulfilling their respective God-given purpose in their lives as they get to know the Lord’s greatness in the process of obeying his will. “Know Your Niche”: a motivating book on staying focused on knowing one’s place in the world despite the pressures and demands of life. “Know Your Niche” is the creation of published author, John Merola, a dedicated evangelist who is passionate in helping people experience the life-changing power of Jesus Christ. Merola shares, “For many years, the prevailing view was that the earth was the center of the universe, and the sun revolved around it. One of the problems with that way of thinking was that the calendar wasn’t working properly. The calendar had to be readjusted continually because it was based upon a false premise. That was until 1543, when Nicolaus Copernicus published a theory stating the earth actually revolved around the sun. The Copernican theory was later proven to be true by Galileo. Published by Christian Faith Publishing, John Merola’s new book is an honest and insightful work that encourages readers to live a godly life without being self-righteous; the more one gets to know the Lord deeper, the more one will realize that he or she should achieve his or her life purpose with humility. Life should not also be lived with a self-centered heart. The Lord himself is generous and gracious, so one must serve others as well. 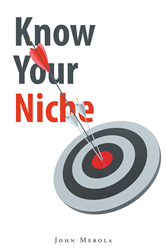 View a synopsis of “Know Your Niche” on YouTube. Consumers can purchase “Know Your Niche” at traditional brick & mortar bookstores, or online at Amazon.com, Apple iTunes store, Kobo or Barnes and Noble. For additional information or inquiries about “Know Your Niche”, contact the Christian Faith Publishing media department at 866-554-0919.